Tom Caldwell was destined to command the room, whatever room that happened to be. 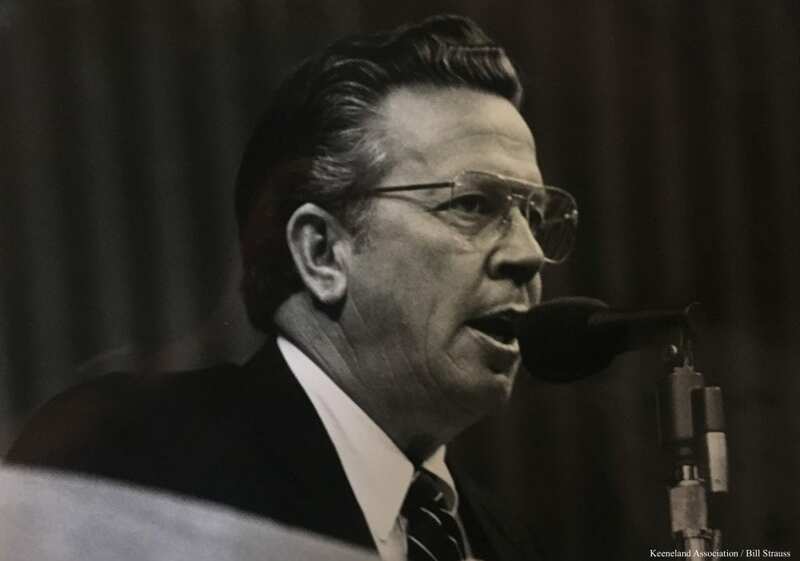 His square jaw, broad-shouldered frame, and booming voice gave him an authoritative presence as Keeneland's head auctioneer, but on a slightly different path it would have given him the same level of clout in the courtroom – either in real life or onscreen as Perry Mason. Caldwell was born in Delaware, Ohio, but his family's ties were set firmly on the West Coast, with his father and grandfather both selling livestock in southern California. Tom followed them to the auctioneer's stand in 1947, and started selling racehorses a decade later. It was during that time that Caldwell attracted the attention of George Swinebroad, then Keeneland's director of auctions and lead auctioneer. Swinebroad was in southern California to handle the dispersal of studio head Louis B. Mayer – the second “M” of MGM Studios – and the brash salesman made a detour to one of Caldwell's auctions on a recruiting trip. In that time, Swinebroad watched Caldwell move the stock and flip seamlessly between speaking English, Dutch, Portuguese, and Spanish to cater to the melting pot of buyers that surrounded him. When the sale was over, Swinebroad greeted him with an invitation to join his team starting with the Mayer dispersal. “He said, 'Boy, I'm gonna tell you one thing. If you come to work for me, I'm gonna make you the best there ever was,'” the younger Caldwell said. Mayer took a liking to Caldwell at the auction, and brought him to MGM Studios to groom him for marketing himself to film executives. It wasn't long before he was offered a potential role of a lifetime as the lead in the Perry Mason television series, which was eventually filled by Raymond Burr for the show's nine-season run. That first introduction to Swinebroad at the stockyard auction had led Caldwell to a life-changing fork in the road. Caldwell spent 19 years working under Swinebroad, offering a smoother, slower chant against Swinebroad's gritty, aggressive cadence – the even-keeled yin to the confrontational yang of his boss. Eventually, his two sons Scott and Cris joined their father on the Keeneland staff, and the pair are still on Keeneland's auctioneer team today. The elder Caldwell assumed Keeneland's lead auctioneer spot rather suddenly, following Swinebroad's death in 1975. He wouldn't miss a Keeneland auction for the next 25 years. Caldwell dropped the hammer on North America's first seven-figure yearling a year later – the $1.5-million Secretariat colt Canadian Bound. However, his career high-water mark came in 1985 selling Seattle Dancer – a half-brother to Triple Crown winner Seattle Slew, by Nijinsky II – whose $13.1-million price tag is still the most ever paid for a year – ling at public auction. Away from the sale ring, Caldwell and his wife Mary maintained the aptly-named Gavel Ranch in Eagle Point, Ore., a 205-acre property that remains in the family. At its peak, the ranch housed a 50-head broodmare band and two stallions, along with Quarter Horses, Standardbreds, and cattle. They also raised four children, who Cris joked were bred for careers using their voice, benefitting genetically from their auctioneer father and their mother, an opera singer. Caldwell died of pancreatic cancer in 2001 at age 72, just missing out on some Gavel Ranch's greatest graduates, including multiple Grade 1 winner Brother Derek and stakes winner Don'tsellmeshort, both campaigned by Cecil Peacock. This entry was posted in NL List, Ray's Paddock and tagged cris caldwell, george swinebroad, Keeneland, keeneland auctions, Thoroughbred auctioneers, tom caldwell by Joe Nevills. Bookmark the permalink.